I didn’t really plan to make over my kitchen–truly I didn’t. 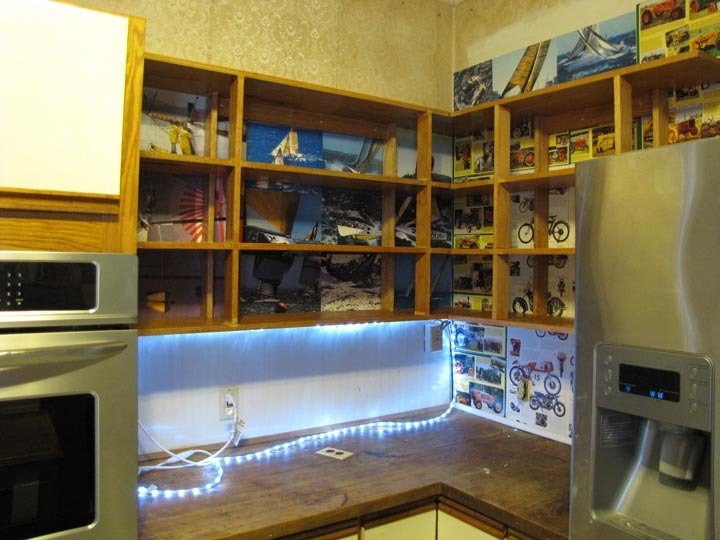 The cabinets are thirty years old and while the base cabinets are still in fairly good shape with nice working drawers, the top cabinets had shelves made of particle board held up by plastic divets. When we discovered that the upstairs bathroom was leaking downstairs, it was time to ‘do something’. 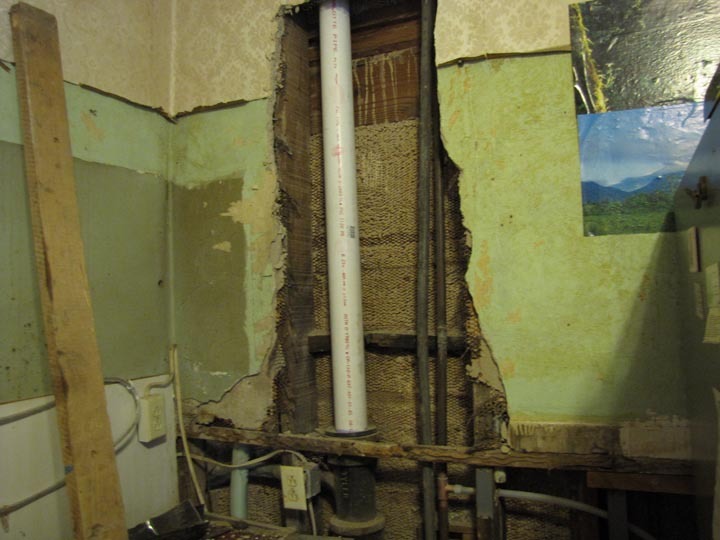 Contractors were contacted, plumber came by and offered his sage advice and the work began. While I was busy upstairs folding laundry, a great deal of banging and thumping emanated from the kitchen. Then I heard excited voices and thundering up the stairs—Mrs. W–We found the problem! actually this is the problem fixed. You can see the lovely mint green stucco wall and where the upper cabinets used to be. Carlos came by and spent a day filling in this hole AND the one in the hallway. plumbing in the upstairs bathroom was repaired and new tile patiently laid by Sam. Sam agreed that he could build some shelves for my kitchen. On Friday, he hung the shelves on the wall and I’ve been busily returning the upper cabinet items from the dining room floor and table where they’ve lived for the past two months. Note the new convection oven on the left that I still haven’t quite figured out how to use. And the wall-paper? I could not match 30 year old wall-paper and so I used the picture portion of calendars we had saved over the years. One of the sailing ones got put in upside down but it makes for a lovely background that suits me–and those are solid oak shelves–not likely to go anywhere or sag.